Hakata Ikkousha – Overworked. Underfed. I think it’s safe to say Costa Mesa is up there with Torrance and Little Tokyo as ramen house hotbeds. Santouka, Kitakata, Ramen Yamadaya are at the top. I’ll throw Shin Sen Gumi in there, but it’s technically in Fountain Valley. Now Hakata Ikkousha can be added to that list. But at a starting price of $9 a bowl, it is sure to be the most expensive bowl in town. Like any good Japanese restaurant, the place is frickin’ small and you can expect to wait for a table. It’s not a horrendous wait (at least for me that night it wasn’t), but I’ve heard there can be a line out the door even before the place opens for lunch. 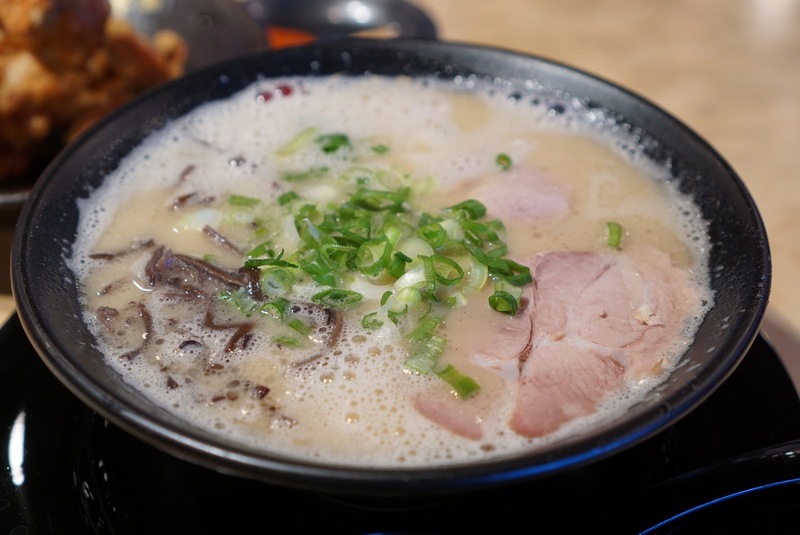 Hakata like all the other aforementioned joints specialize in tonkotsu ramen. 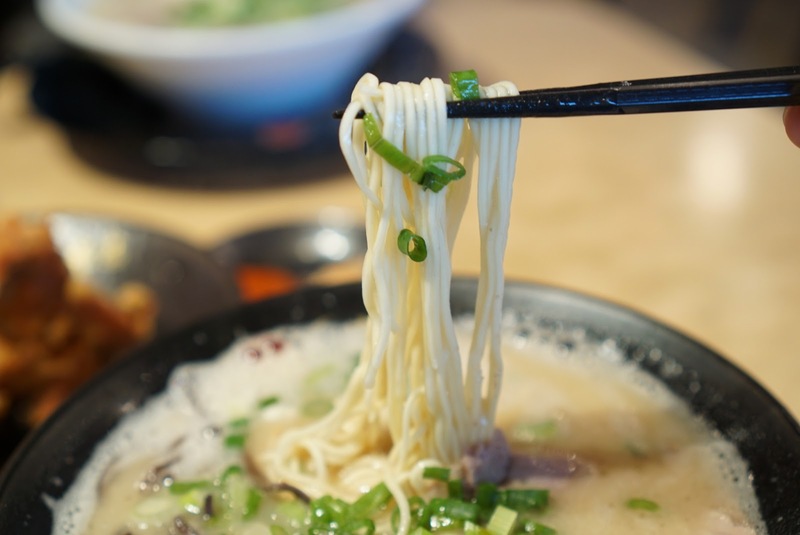 Like Shin Sen Gumi, you can customize your broth and noodles. 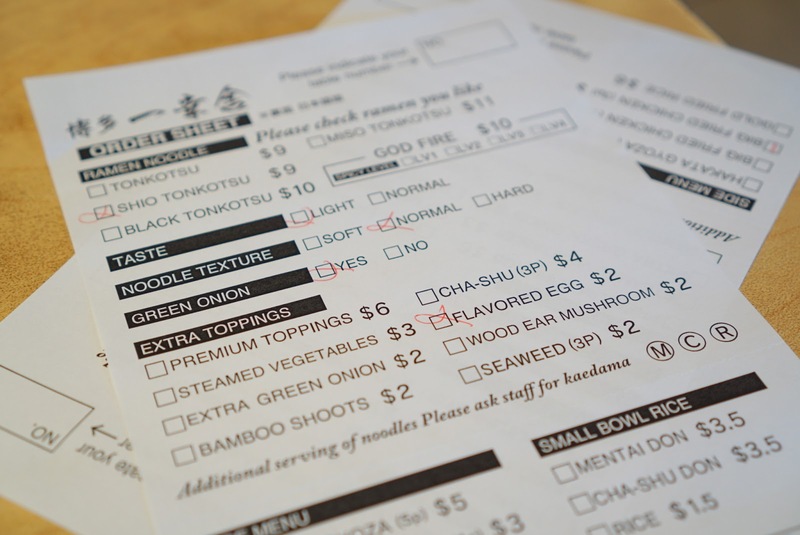 You can also add extra toppings for few bucks here and there. If you went to town, you could easily end up with a bowl over $30! Lo-Ma Linda with Big Head TalksAlot’s mini me in tow joined me for a first time visit here. Table side accoutrements. Can I say that in a Japanese restaurant? I’m sure there’s a better word for it, multiple syllables and probably ends in a vowel. Fishing Zebra Man vouched for the fried chicken, but I was underwhelmed. It lacked that savory umami-ness that I come to expect from karaage. 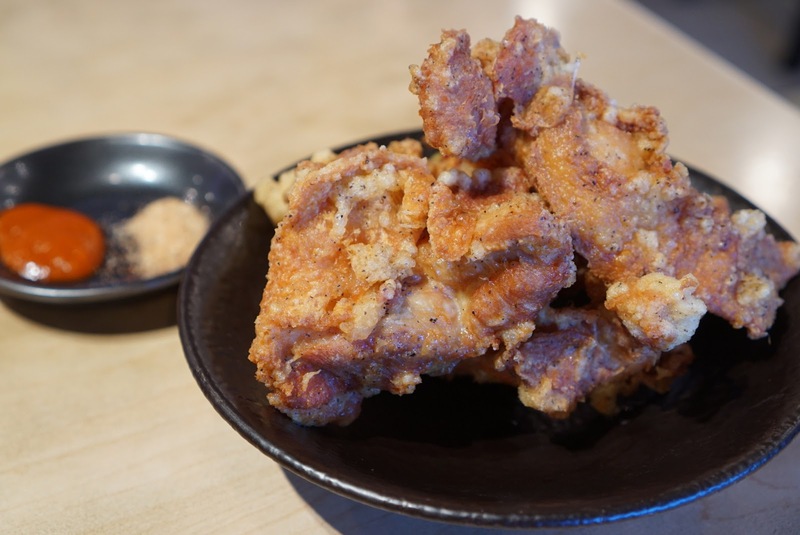 The best part was probably the fried skin, which you don’t get with karaage. 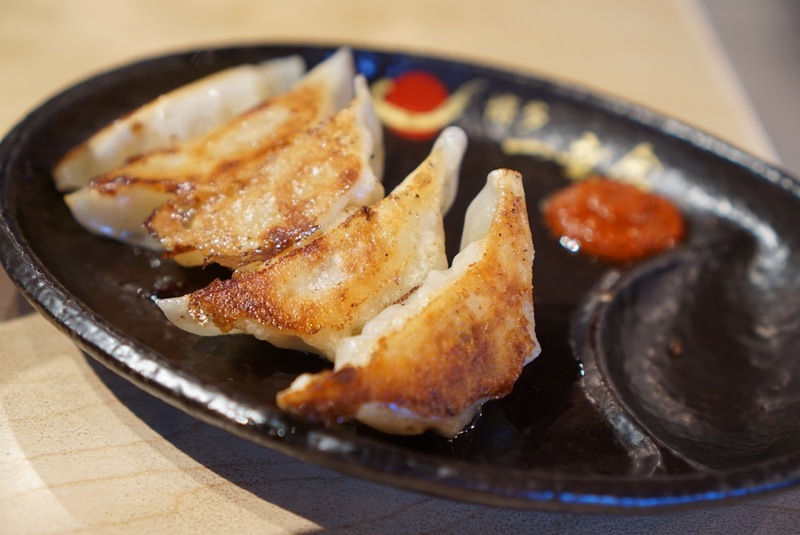 I almost never order gyoza, but some Yelpers delighted in the crispy skin and juicy filling. The skin was crispy but the filling was so small. I’m not expert in gyoza so I can’t really say how this compares to other places. 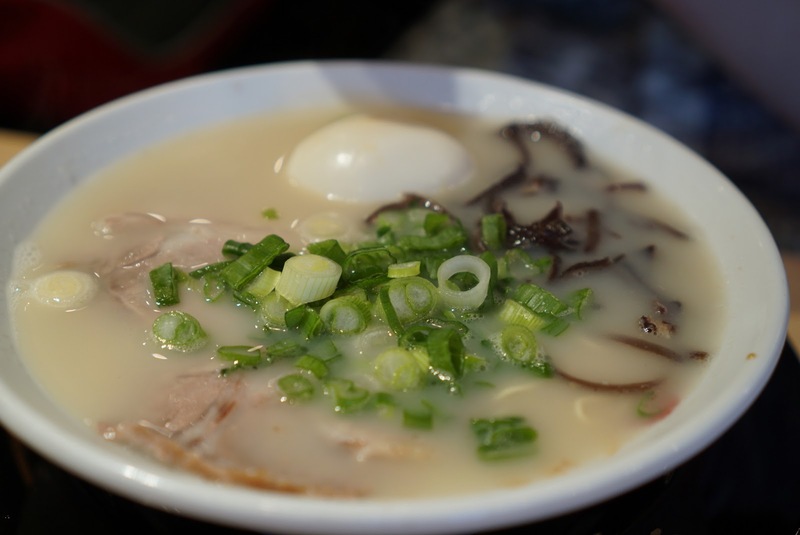 It’s hard to pinpoint how the shio compares to the regular tonkotsu. I just know I liked the regular better. The broth at Hakata is especially rich. The chasu is not super duper fatty. We’re doing good so far! The noodles here are straight. I like curly noodles. 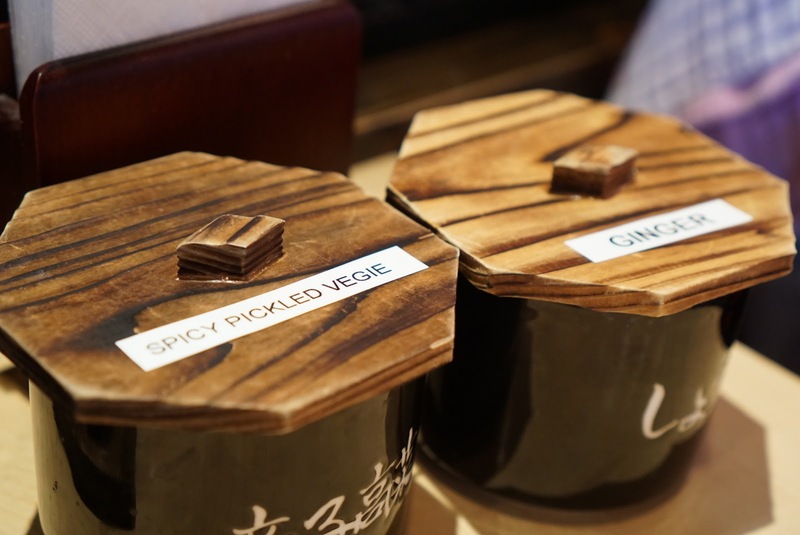 It’s odd how such a minor detail makes such a major difference in the whole ramen eating experience. Shin Sen Gumi also does the straight noodle thing, which is a knock against them in my book. I should have taken a picture of the other flavor additives on the table. Of course, there was your spicy powder stuff. But there was this interesting “ramen flavor” bottle which basically was the umami kick I was looking for. It was like a very tasty salty concentrated ramen flavor. I added a whole bunch to my bowl and I was a lot happier for it. All in all, I would put Hakata second to my all time favorite Santouka. There are certainly peddling a high quality bowl of noodles here and the price tag certainly speaks to that. I would certainly come back if I wanted to change things up a bit and wanted a heartier bowl than what my food court favorite offers.